Baglamukhi Maha Yantra is used to obtain the power and dominance over enemies. Baglamukhi yantra is considered to be very powerful and useful yantra to obtain victory over enemies, law suits, and success in quarrels and competitions. The yantra named after the deity, goddess Baglamukhi, is also the controller of this Yantra who encharges the Yantra with occult forces. Worshiping of this yantra is performed by wearing yellow dress, on yellow asana, with yellow flowers and yellow beads. The maximum power of the Yantra is generated from the planet, Mars. 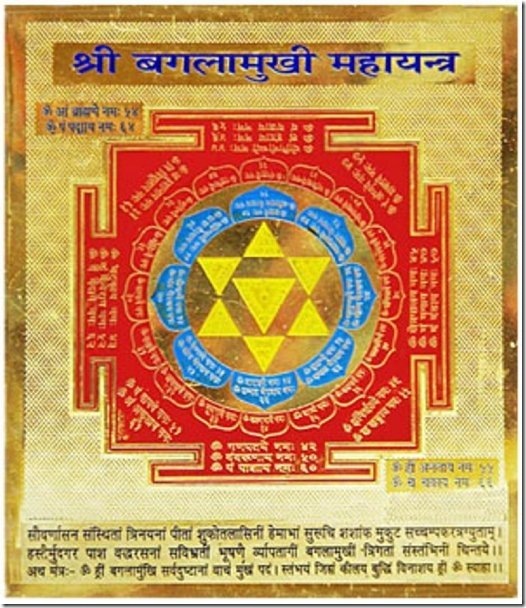 This Maha Yantra basically is drawn by Turmeric, Dhatura flowers juice, or yellow orpoinent on a piece and is worshipped to gain success. Baglamukhi yantra is considered to be very effective to ward off the evil effects of souls and Yakshani. 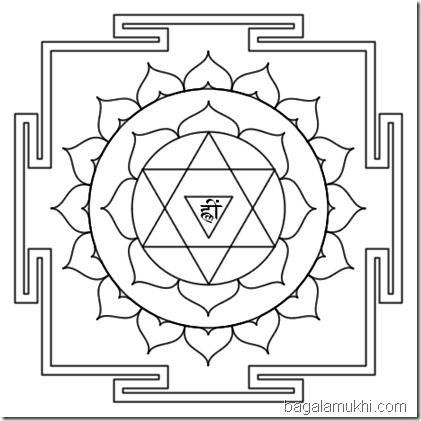 People also used this yantra to succeed in winning in gambling. Purify your body and start with a clear and positive attitude. Locate a place on the floor towards east. Make sure you won’t be disturbed during the prodecure. Light the incense or oil lamp. Either make the Yantra or open it (if it is printed) and place it along with the image of the deity of yantra and your isht God. Close your eyes and concentrate to let the deity to bless you with wishes. With all sincerity, ask God to grant you the desire of your life that you wanted to be fulfilled (In your own language).